White cotton with nineteen steel-wire hoops. One of the most characteristic features of fashion during the middle of the 19th century was the crinoline style. The crinoline originally was a type of petticoat made of linen and interwoven with horsehair ("crin" in French). The petticoat's structure was frequently improved with the swell of skirt. 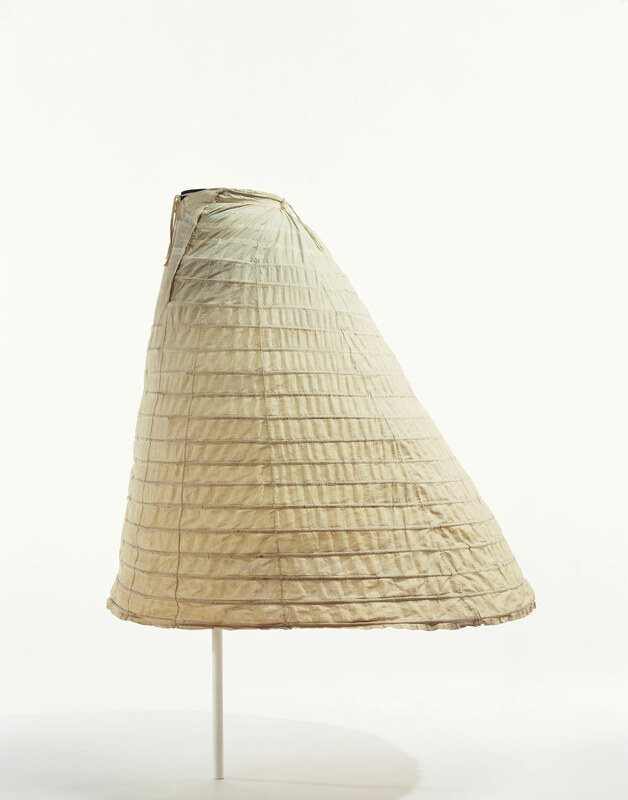 Towards the end of the 1850s, an innovative cage crinoline, made by connecting a series of hoops made out of steel and whalebone, was produced. With the appearance of the cage crinoline, which was easy to put on and take off, the skirt continued to expand, and reached its maximum size in the mid 1860s. The cage crinoline grew out of proportion, and it was troublesome just to walk or pass through a door; this made everyday life difficult, and criticism of the crinoline grew in response. During this period, the crinoline phenomenon was often used as an element of satire in magazines.